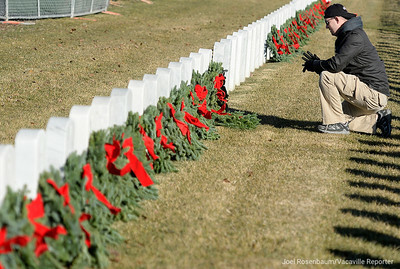 Samuel Stewart of Sacramento pauses after placing a wreath on the headstone of his father who is buried at the Sacramento Valley National Cemetery during the Wreaths Across America Ceremony Saturday in Dixon. 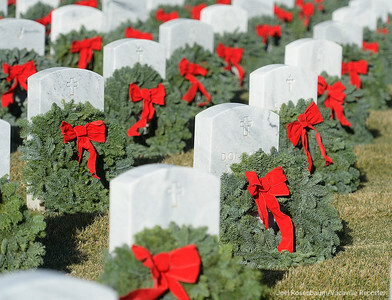 The annual wreath laying event that started at Arlington National Cemetery over twenty years ago and has spread to veterans’ cemeteries and other locations in all 50 states and beyond. 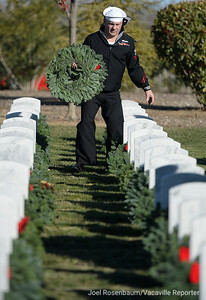 Several thousand people who came to the Sacramento Valley National Cemetery, Saturday to place 20,000 wreaths on headstones during the annual wreath laying event that started at Arlington National Cemetery over twenty years ago and has spread to veterans’ cemeteries and other locations in all 50 states. 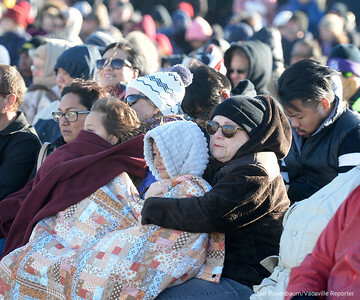 Sophia Schulz, 9 of Brentwood (left) huddles on the lap of her aunt, Laura Mungo of Granite Bay as her sister, Adrianna, 6 sits with their grandmother, Carol Schulz of San Jose as they listen to speeches during the Wreaths Across America Ceremonies Saturday at the Sacramento Valley National Cemetery in Dixon. 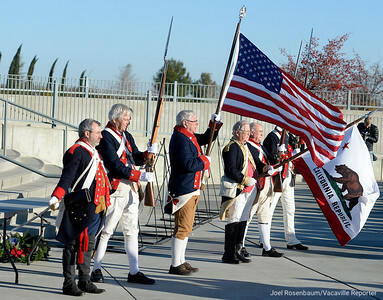 Members of the California Society of the Sons of the American Revolution and the California State Color Guard present the colors at the beginning of the Wreaths Across America Ceremony at the Sacramento Valley National Cemetery in Dixon on Saturday. 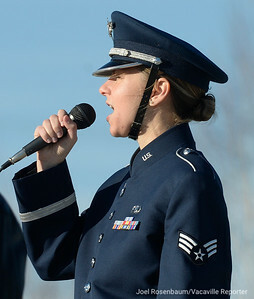 United States Air Force Sr. Airman, Michelle Doolittle of the USAF Band of the Golden West performs "God Bless America" during Wreaths Across America Ceremonies. 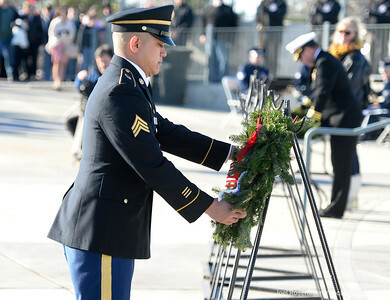 A member of the United States Army places a wreath honoring their fellow service members who are during at the Sacramento Valley National Cemetery during the Wreaths Across America Ceremony Saturday in Dixon. 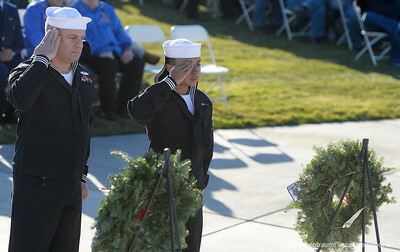 United States Navy hospital corpsmen, Scott Ott (left) and J Rosales salute after placing a wreath honoring their fellow service members who are during at the Sacramento Valley National Cemetery during the Wreaths Across America Ceremony Saturday in Dixon. 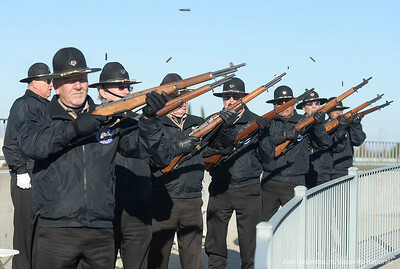 Members of the Sacramento Valley National Cemetery Honor Guard fire a rifle salute at the conclusion of the Wreaths Across America Ceremony on Saturday in Dixon. 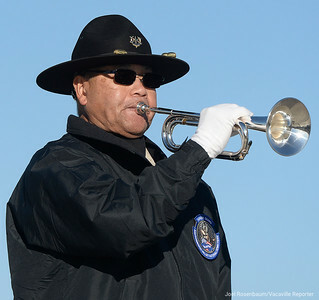 Sacramento Valley National Cemetery honor guard member, Baldwin Wong plays "Taps" at the conclusion of the Wreaths Across America Ceremony on Saturday in Dixon. 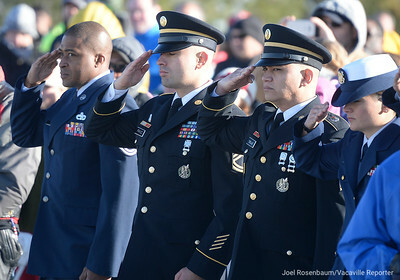 Members of United States Air Force, Army and Coast Guard salute as "Taps" is played at the conclusion of the Wreaths Across America Ceremony on Saturday in Dixon. 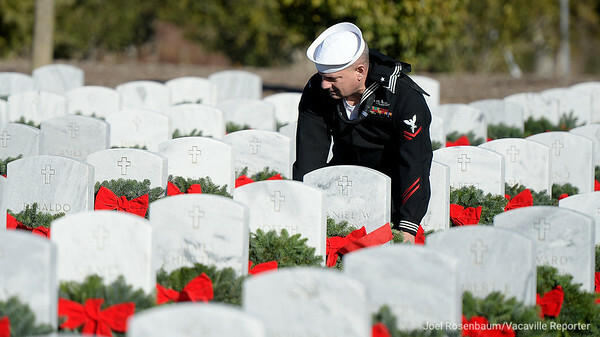 United States Navy hospital corpsman Scott Ott places a wreath on a headstone at the Sacramento Valley National Cemetery in Dixon, California on Saturday, as he participates in Wreaths Across America. 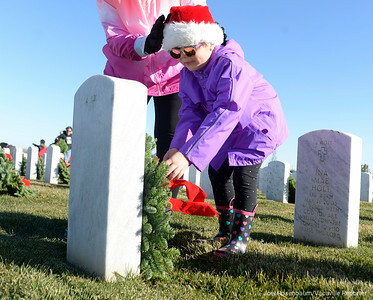 Jasmyne Krystek, 5 of Vacaville places a wreath on a headstone at the Sacramento Valley National Cemetery in Dixon, California on Saturday, as he participates in Wreaths Across America.